Olentangy’s Sean Marks watches his shot as the referee singles for three during the second half of Tuesday’s non-league showdown in Sunbury. Marks finished with a game-high 22 points in the Braves’ 67-50 win. 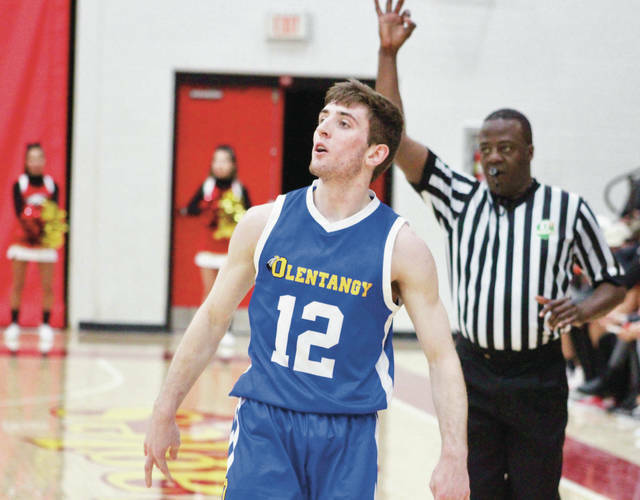 SUNBURY – It didn’t take long for Sean Marks to get going fresh off becoming the all-time leading scorer for the Olentangy boys basketball team. The senior scored the first five points and 16 of his game-high 22 in the first half and added five rebounds and four assists to his ledger. His driving score on the first possession of the second quarter gave Olentangy the lead for good in a 67-50 win at Big Walnut in non-league action Tuesday night. It’s Olentangy’s eighth-straight win and 19th of the last 20 in the series. A Marks basket started a 12-4 run to end the half. At that point he had 16 of the team’s 23 points. Then others got going. Alex Sieve scored inside and fed to Luke Riedel for a basket on the next possession. Riedel and Noah Gossett each hit threes to end the run with Olentangy leading 33-22 at the break. Sieve added 10 points, Noah Gossett chipped in eight points, Riedel had seven points, Austin Brown had seven rebounds to go with six points and Caleb Steele had eight rebounds for Olentangy (8-5), which picked up its third straight win. Jake Elmore scored five straight points in the third quarter as Olentangy increased its lead to 48-30. But Nathan Montgomery sparked an 11-0 run with a pair of free throws and an and-1 to pull BW within seven early in the fourth quarter. Sieve ended the rally by converting a 3-point play and Olentangy scored nine of the next 11 points to blow it open. Kegan Hienton had 10 points and five rebounds to lead a balanced BW attack. Montgomery added nine points, three assists and three steals; Carson Becker chipped in eight points, eight boards and three steals; and Brody Lawhun had six board for the Golden Eagles (8-6). BW is at a crossroads according Bartlett after losing its third straight game. Next, the Eagles travel to New Albany in OCC-Capital action Friday night. Olentangy hosts Westerville North in OCC-Buckeye play Friday night. Both games are scheduled to tip at 7:30 p.m.